Now we have devices and apps - a STB for Freeview, which has apps, Chromecast, for which you need to use apps on your phone and ipad, a Roku stick and its apps, and the LG scrreen also has apps. Of course, some apps work on some devices and not on othrs, hencee the plethorra of HDMI slots used up and the perplexed state of my spouse. And who can blam her. 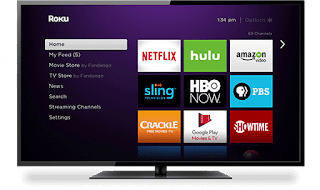 Technologists often sell their technology on making life easier and they spend fortunes on researching "user experience" and the current situation for IPTV is just dreadful. The troublee is Mobdro sails very close to the wind and I'm no lawyer, but I'm pretty confident that using it to access some of the content it makes available may well be illegal. But it does open the door to how an ideal TV app should work from a viewer's perspective.